This year members of the Association assembled with the Combined Irish Regiments Association to ensure that there was a group of marchers of reasonable size. The Association does have its own position in the march past of veterans, but as the parade is in columns of six persons across, we need a lot of Leinster Association members and families who are able to march down Whitehall to turn out. Other Associations experience a similar challenge so it makes sense that we all march together as Combined Irish Regiments. The weather more or less stayed fine for us. As forecast, between 9am and 10am, at intervals it showered with rain and those without a top coat or umbrella braved the weather the best they could. By 10am as we prepared to march off Horse Guards Parade Ground into Whitehall, the sun came out, and apart from the odd grey cloud the marchers were treated to a windy though sunny morning. After the march down Whitehall when a wreath, to commemorate all fallen Irish Soldiers, was laid at the Cenotaph, the parade marched back to Horse Guards where H.R.H. Prince Philip, The Duke of Edinburgh took the salute. What's more, as a marcher when you looked at HRH, he looked right back at you! 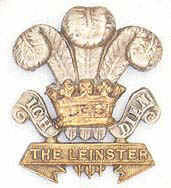 Thanks to all Leinster Regiment Association members who turned out to parade; our youngest was only eight years old and wore his Leinster caubeen with pride as he marched down Whitehall, arms swinging in a true military fashion! Not to be outdone, his two cousins, both young girls age nine and eleven fell in also! A special thanks to all those families who joined the crowds to applaud as we marched past. There cannot be another experience like being part of the annual Whitehall parade that honours all the past soldiers of the regiment. Well done everyone!